Sweet-toothed Sheffielders are in for a treat at the Rutland Arms on Saturday, December 3rd. My favourite part of the meal is when dinner has come and gone, and dessert-time is approaching. The smell of hot puddings when it’s dark and gloomy outside spells HEAVEN to me! I’m looking forward to meeting and seeing enthusiastic pud’Oholics at my next ‘Pudding Club’ and the list of treats I’m currently putting together for you is looking awfully sweet too. 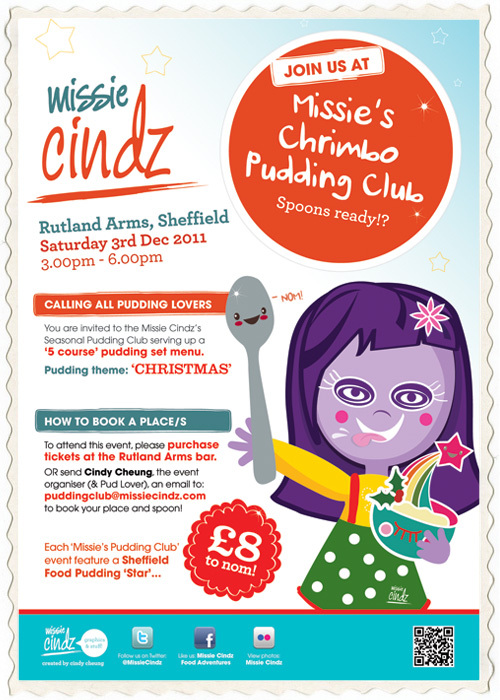 Tickets will be available from Monday 14th November 12 noon from The Rutland Arms bar, the event venue (Brown Street, Sheffield) or you can send Cindy Cheung, the event organiser (and Pud Lover), an email to: puddingclub@missiecindz.com to book your spoon (from 14th November). Please allow 24 hrs for email confirmation of your booking, your place/places are not guaranteed until you receive this email. There are only 20 places available so please book early – tickets priced £8 per spoon (per attendee). Food served Monday – Saturday 12-9pm and Sunday 12 – 6pm. Street parking.